A police manhunt was under way last night in villages near Heathrow amid fears a third-runway protester is behind the latest drone shut down. 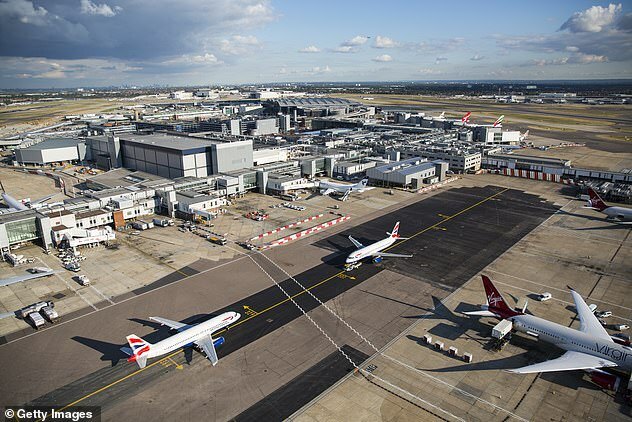 Officers are scouring Harmondsworth and other villages just half a mile from Europe’s busiest airport for the culprit, and Scotland Yard has launched a ‘full criminal investigation’. Around 100 flights were delayed as the airport was locked down for an hour on Tuesday evening after a drone was spotted flying nearby. Yesterday, the first pictures emerged of an object believed to be the drone, which has a flashing green and red light. They were taken by a passenger on a grounded plane and a commuter driving near the airport’s southern boundary. Another witness reported seeing a drone with the same flashing green and red light hovering near Harmondsworth. It is one of the villages, alongside Sipson and Longford, to be bulldozed as and when the third runway wins planning permission. 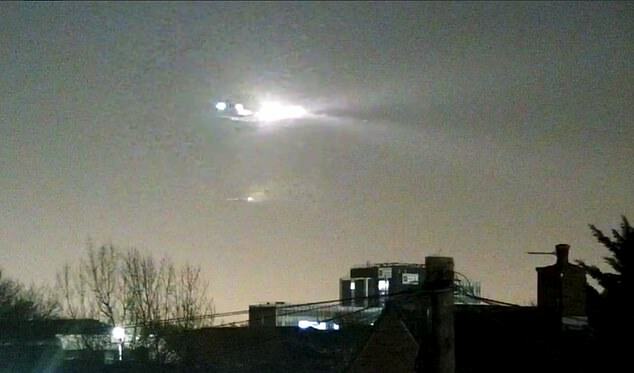 The witness told the BBC: ‘I could tell it was a drone – these things have got quite distinctive lights – not a helicopter’. In July last year it became a criminal offence to fly a drone within 0.6miles of an airport. Harmondsworth is just half a mile from Heathrow’s northern perimeter. Anti-Heathrow expansion campaign group Hacan said it had nothing to do with the drone. Last night campaign groups Stop Heathrow Expansion and No 3rd Runway also said they had nothing to do with the drones. 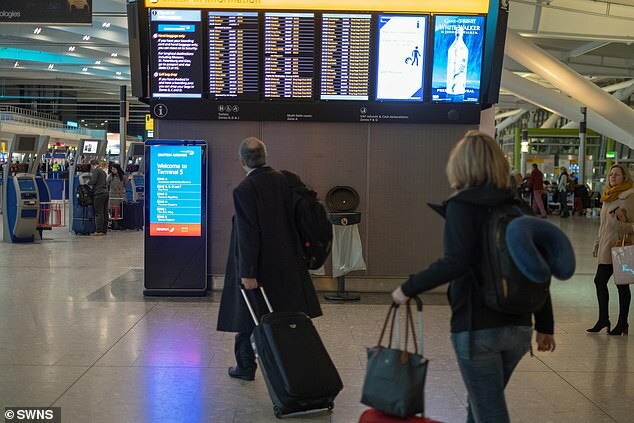 It is not yet clear whether the drone incursion was deliberate – but with the operator of the drone which brought chaos to Gatwick still at large, police cannot rule out a link. Police confirmed it was not a hoax sighting, stressing that officers were among those who spotted a drone. 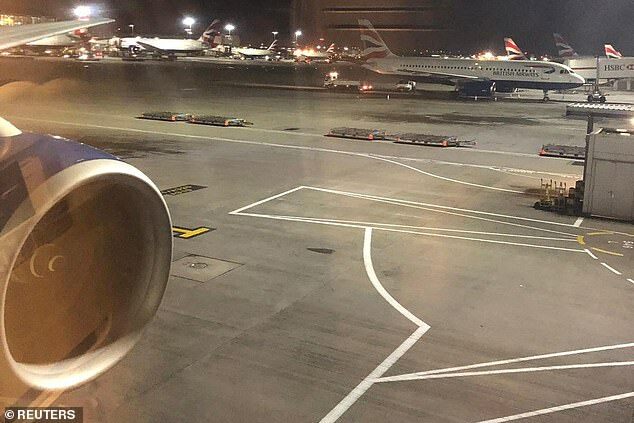 Extra officers have been sent to Heathrow, as airports around the country were put on high alert. The RAF has flown in its own anti-drone system to Heathrow after Transport Secretary Chris Grayling spoke to Defence Secretary Gavin Williamson. Heathrow has also begun talks to install a £10million detection and signal jamming system called Auds. Will Geddes of security service International Corporate Protection said the incident was ‘inevitable’ and security should have been upgraded sooner. Last night the Department for Transport rejected claims that the military-grade anti-drones system should have been installed sooner. Aviation minister Baroness Sugg and security minister Ben Wallace will hold a meeting with airport bosses today to discuss plans to crack down on the drone menace.